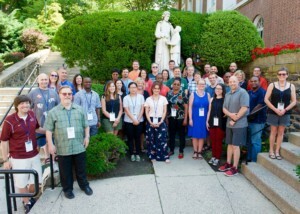 This year’s Buttimer Institute of Lasallian Studies took place June 24 – July 7 at Manhattan College in Riverdale, New York, with 40 participants in Buttimer I, 35 in Buttimer II and 32 in Buttimer III. 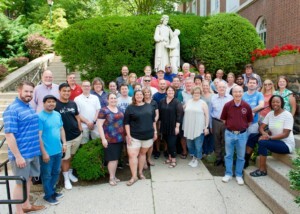 Buttimer brings together participants for two weeks each summer for three consecutive summers to study the life and work of Saint John Baptist de La Salle and the origins of the Lasallian mission. 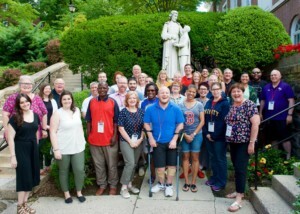 Buttimer II participant Colleen Dunne, director of Campus Ministry at Saint Mary’s University of Minnesota in Winona, called it an “incredible experience” to gather with participants from different countries, types of institutions and roles who are excited about the Lasallian mission. Every year, Buttimer attracts an international audience. Some of the countries represented at this year’s gathering included New Zealand, South Africa, Kenya, Papua New Guinea, Singapore, Nigeria and Pakistan. Rana Brogan, traveled from Victoria, Australia, where she is deputy principal of Faith and Mission at De La Salle College in, to complete her second year of the Buttimer Institute. This is the second year in a row that Buttimer was held at Manhattan College, where it first took place in 1984. Prior to last year, Buttimer took place at Saint Mary’s College of California in Moraga for 25 years. Buttimer, a program of the Office for Lasallian Education at Christian Brothers Conference, is named in honor of Brother Charles Henry Buttimer, FSC, (1909-1982), the first American Superior General of the Brothers of the Christian Schools (1966-1976).